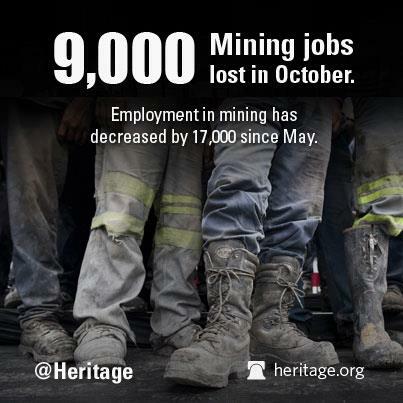 Buried in Friday’s Bureau of Labor Statistics report on the country’s unemployment situation was this disheartening fact: 9,000 employees of the mining and resource extraction sector lost their jobs in October. That brings total job losses in that sector to 17,000 since May, according to BLS. The Mining sector comprises establishments that extract naturally occurring mineral solids, such as coal and ores; liquid minerals, such as crude petroleum; and gases, such as natural gas. The term mining is used in the broad sense to include quarrying, well operations, beneficiating (e.g., crushing, screening, washing, and flotation), and other preparation customarily performed at the mine site, or as a part of mining activity. Energy has become a hot-button issue of late as the country debates major regulations on industries that fall under BLS’s “mining” rubric and taxpayer incentives for other energy sectors. While the president often touts his policies as friendly to the conventional fuel industry, BLS’s numbers suggest the sector is hitting a financial rough patch.